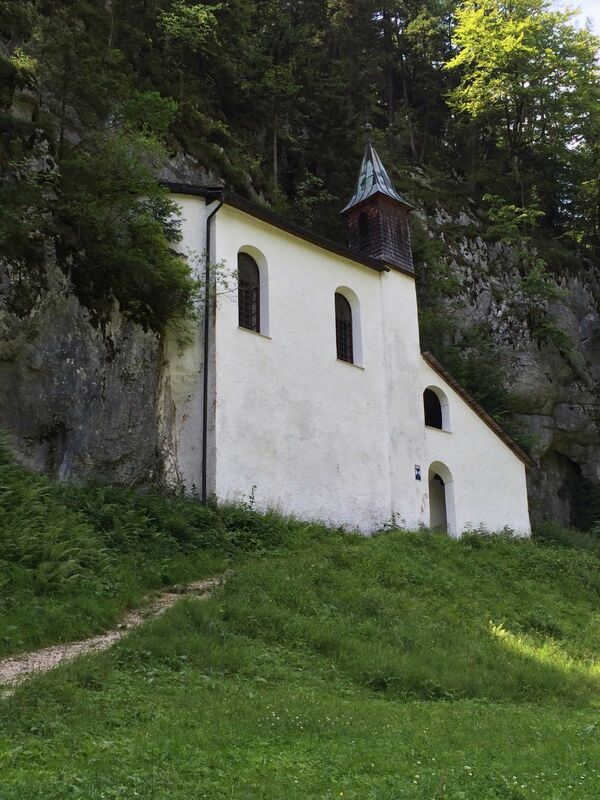 Our 18 day trip to Munich, Salzburg, Vienna and Prague, with a 6 day hike in the Austrian Lakes area was fantastic. We had been planning this trip for a good year, though we knew 2 years ago that we would be taking this trip. We always do our own trip planning, spending lots of time reading descriptions as well as reading reviews on TripAdvisor. Its very time consuming, but it always has paid off for us. Our travel preferences are to stay off of the beaten track. My guiding motto is ‘when I wake up in my hotel in (insert city here) I want to know that I'm in (insert city here) and not Cincinnati or Washington or any other big US city.' To that end, we generally stay away from chain hotels and seek out smaller. locally owned inns and hotels. We also try to plan our time to have a mix of learning about the history of the place and having time to just wander the streets on our own. Typically we rent a car so we can get out and explore, but on this trip we didn't and used trains and public transport the entire time. We stayed 2 nights at the Hotel Am Viktualienmarkt. This hotel was located a 2-minute walk from Munich's Viktualienmarkt, a 200 year old market which features an incredible variety of fresh fruit and vegetables, meat, seafood, sausage, beer, pastries, prepared foods, olives, etc… We ate 2 of our lunches at the Viktualienmarkt which allowed each member of the family to get what they wanted. 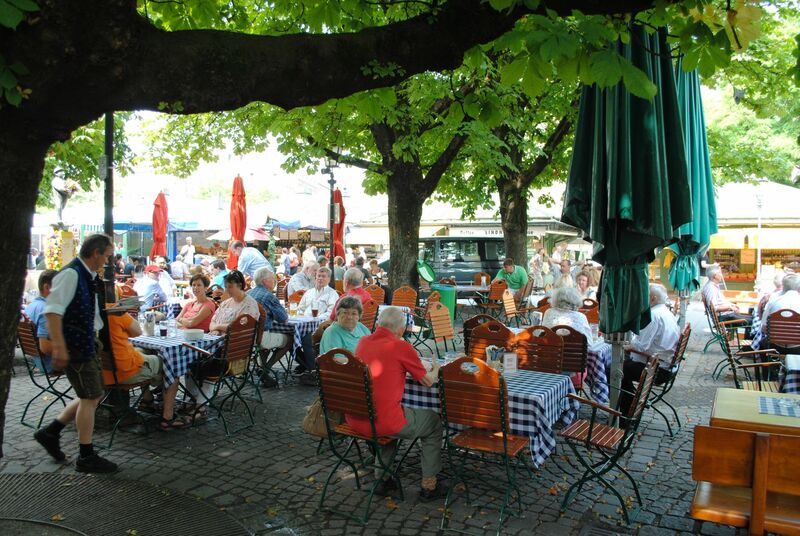 A large beer garden in the middle of the market has tables where you can bring your meal and sit to enjoy it. There is a both a taxi and a tram stop right outside of the hotel, it's a 10 euro cab ride to the train station. The hotel had a family room which enabled all 4 of us to stay in one room. We were there during an incredible heat wave and the hotel does not have AC (which many independently owned hotels and inns don't in Munich), but we were provided with fans and survived just fine. We would definitely stay there again. 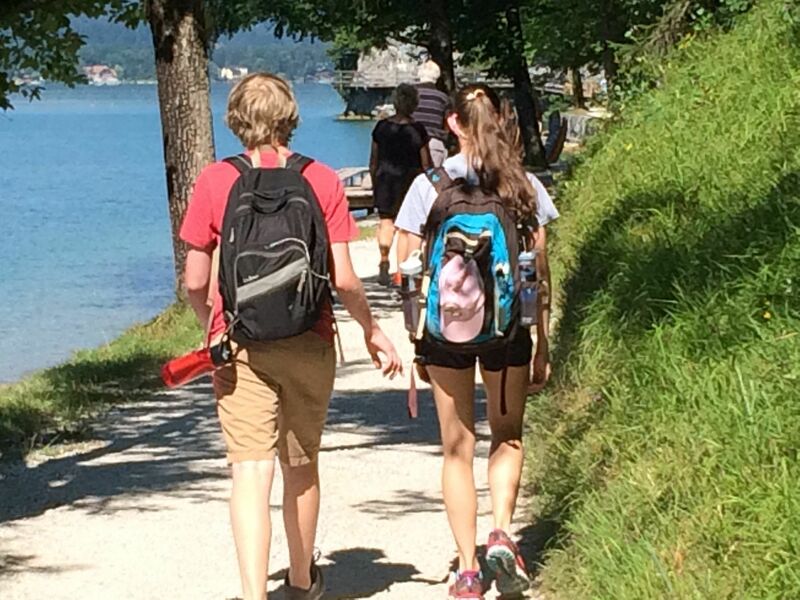 We took 2 tours with Radius Tours, Walking Tour of the Third Reich and Dachau Concentration Camp. I've got mixed emotions about this tour company. Full disclosure, we did the walking tour on the afternoon that we arrived in Munich after our overnight flight and it was 95′ F, but while very informed and educated, our guide was not very engaging. We did learn about the Third Reich, but were glad when we were done. Having a guide to take us to Dachau seems a good investment if for no other reason than to manage the transportation. The only downside is that you are not at your leisure to explore what interests you at the camp. Our Dachau guide was more engaging and equally informed. 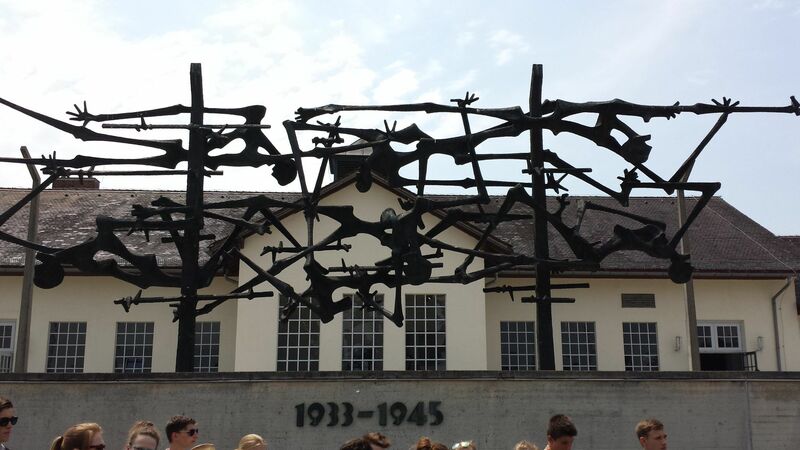 Whether or not you have a guide, Dachau Concentration Damp is definitely worth your time. 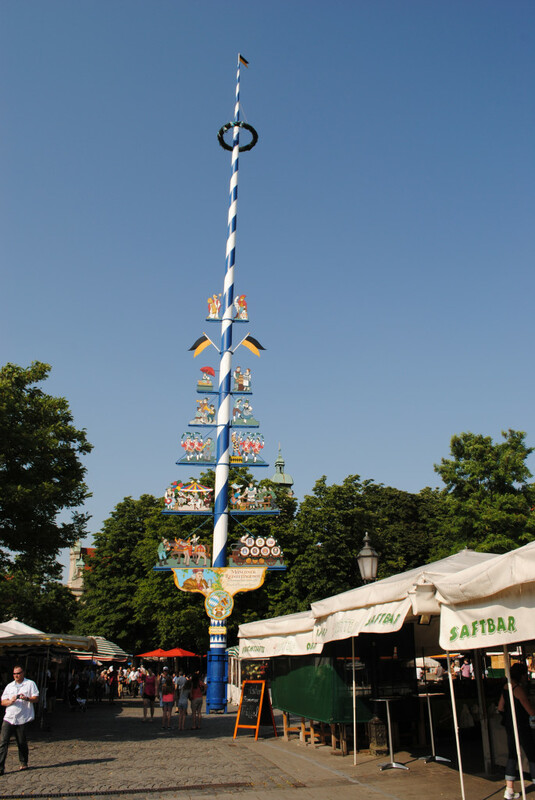 It is a quick 30-minute train trip from Munich and then a 5 minute bus ride from the Dachau train station. We had a phenomenal meal at Der Pschorr, which is located right at the Viktualienmarkt. Highly recommend. We had a hard time finding a room that would accommodate the 4 of us, and so ended up breaking our ‘independent and local' rule and stayed at the Crowne Plaza Pitter Hotel in Salzburg. I've got to be honest, it was really nice to have some AC at this point in our trip. The Pitter was located a 2 minute walk from Mirabell Park and Gardens, which we easily walked through to reach Old Town. The Imlauer restaurant at the top of the Pitter was fantastic. Just to say you did, you probably need to have a Salzburg Nockerl while in Salzburg. 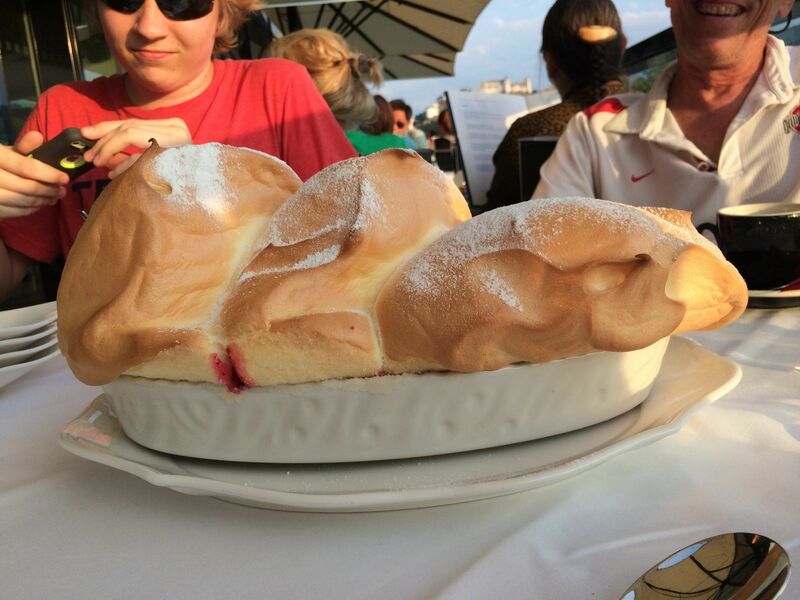 The Salzburg Nockerl is basically a a trio of souffles with a berry sauce underneath. Our waiter explained that the three mounds represent the three the hillsides surrounding Salzburg, the Festungsberg, the Monchsberg and the Kapuzinerberg. I have mixed emotions about the Old Town…it was a zoo. Given that it was the height of tourist season, it was hard to walk and to see anything. We did buy tickets to take the incline up to Salzburg Castle, which was a good investment and less crowded. From Salzburg, we took a 45-minute bus ride to Berchtesgaden, Germany to tour the Obersalzberg and Hitler's Eagle's Nest. 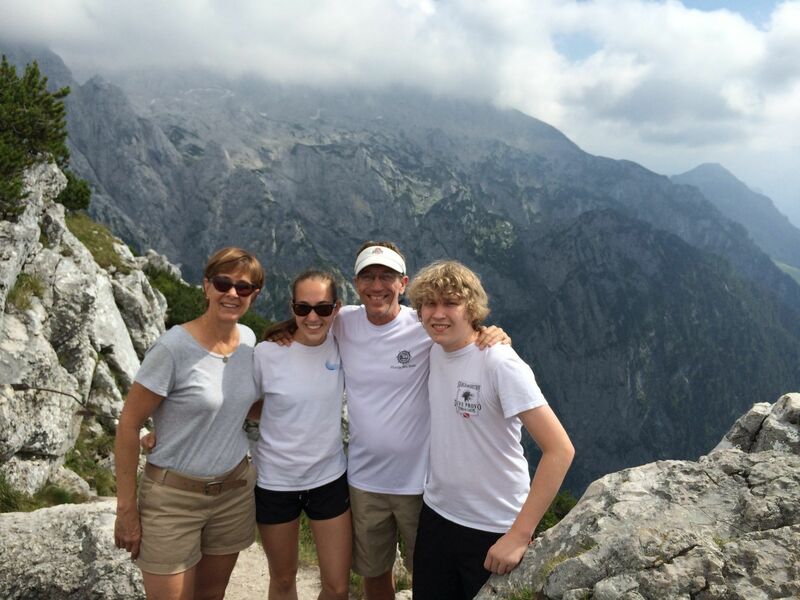 Highly recommend Eagle's Nest Tours in Berchtesgaden. 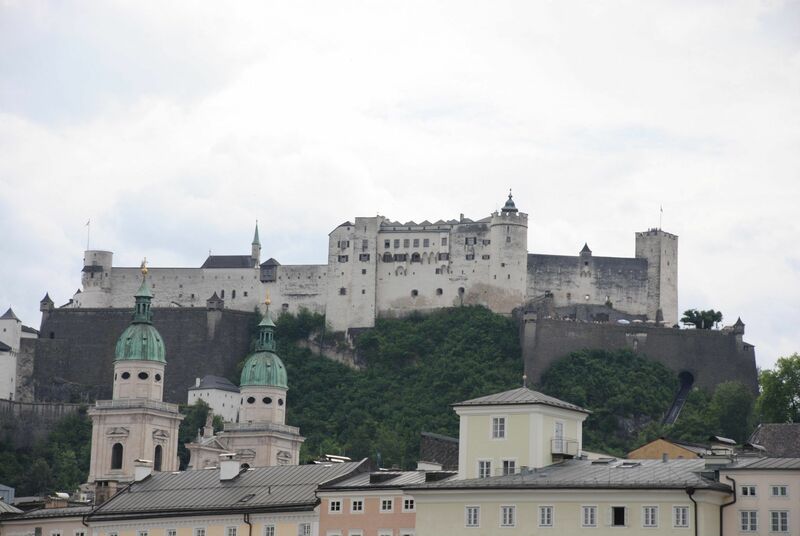 The bus ride up to the Obersalzberg was a detailed history of the area and it's buildings. In contrast to the Radius Tours in Munich, I was disappointed when this tour concluded. Had pastries at Schatz Konditorei. A tiny little bakery off of a tiny little alley! A great find recommended to us by a American living in Salzburg. This is a hard one. We stayed at Pertschy Palais in Vienna. The location of this hotel could not have been better. It was literally a 1 minute walk to the heart of the Graben and 2 minutes to St. Stephen's Cathedral. The staff was wonderful. Once again, it very hot in Vienna and we had no AC in our room, but we were met with cool washcloths and ice cold lemonade upon our returns to the hotel. The hotel had a Miss Havisham feel to it…had truly been a grand palace in the past and just hasn't been maintained. It could be such a fantastic hotel with some paint and TLC. 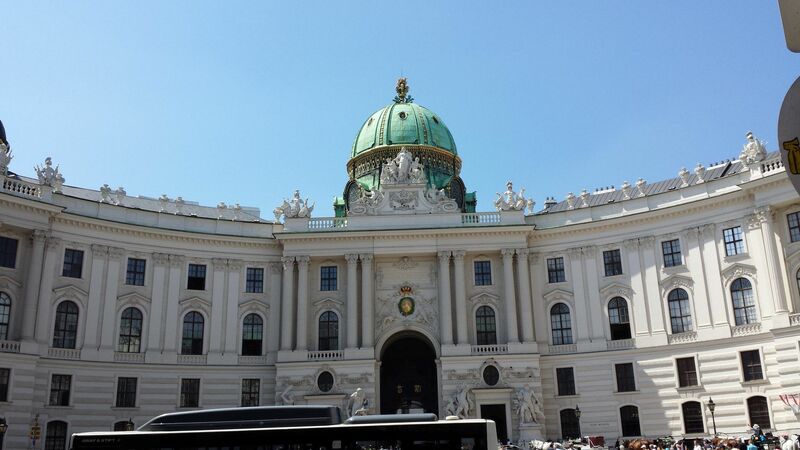 We hired Bettina Mandl to take us around the Hofburg and other sites of Imperial Vienna. She was a charming, engaged and, informed guide and we all enjoyed every minute of the 4-hour tour. No trip to Vienna would be complete without the requisite Thai dinner for the Spencer family. We ate at Patara and weren't disappointed. It may have been a little expensive for the portion size, but it was delicious. 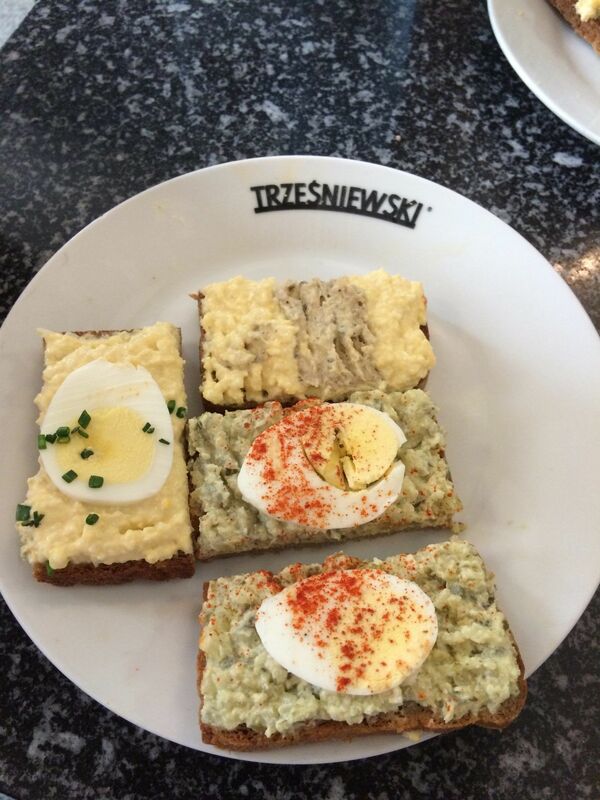 We had a lunch at Trzesniewski, which is Vienna's 100-year old version of fast food. Small open-faced sandwiches with an assortment of toppings like cream cheese, egg salad with bacon, salmon. To go with their small sandwiches, they have small beer steins called ‘pfiff'. Fun! I took it upon myself, in the best interest of all mankind, to determine the best Apfel Strudel in Europe. 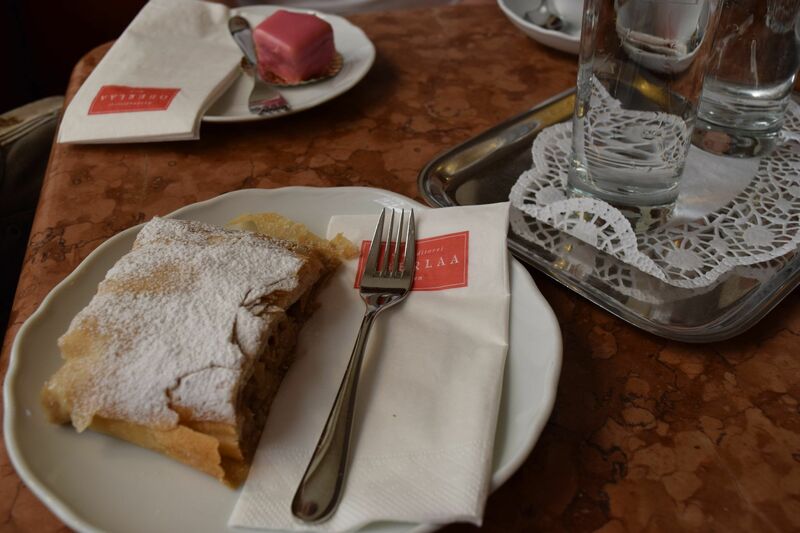 We stopped at Kurkonditorei Oberlaa twice while in Vienna and their strudel was outstanding. Highly recommend Iron Gate Hotel in Old Town Prague. 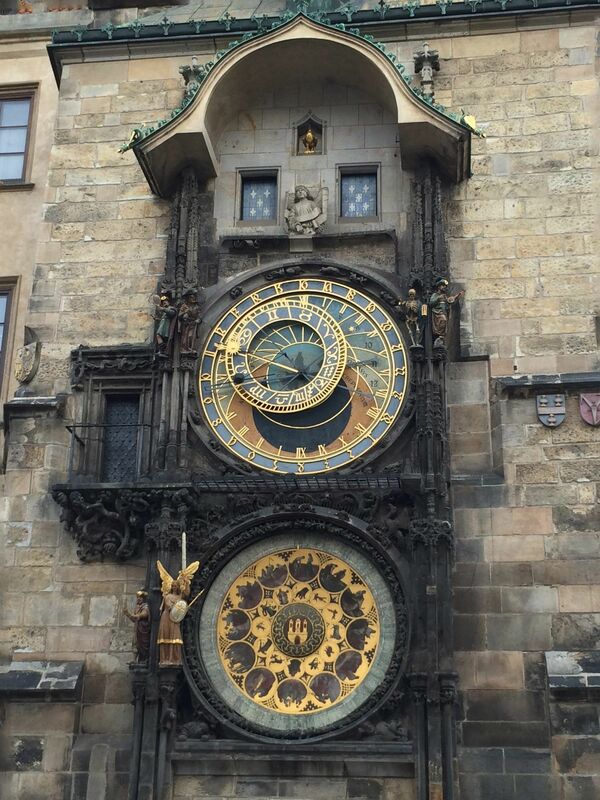 The hotel is literally a few minutes walk to Old Town Square and the Astronomical Clock. While centrally located, it is in a small alley that keeps it away from all the crowds. Our hotel room was 2 stories and very comfortably accommodated the 4 of us. We took two tours with Naked Tour Guides, Explore Prague Historical Tour and Prague Castle at Night. Marcus and Imogen were well informed and engaging. We knew nothing about Prague when we got there and feel we have a good understanding of Prague's place in world history after these tours. Marcus also gave a very detailed explanation of the workings of the Astronomical Clock, which is quite a piece of engineering, especially given that it is 600 years old and the only time it is know to have lost time is when an explosion rocked a near by building. My takeaway of Prague is that is a really beautiful old city with delightful architecture and a remarkable history. The current exchange is a mixed blessing for Prague. It makes visiting this old city very reasonable, the downside being that the Pub Crawl industry is booming! It felt a little like spring break in Ft. Lauderdale, which is not what I was looking for. 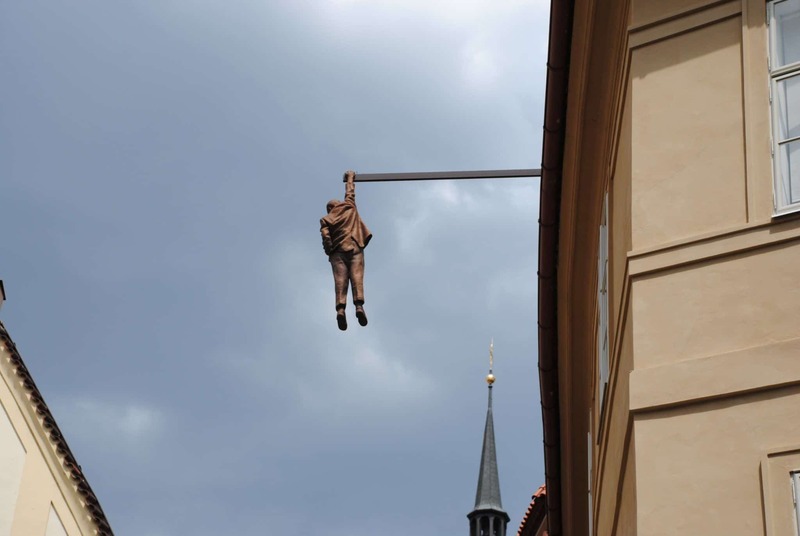 Look for the sculptures of David Cerny throughout Prague. We had great meals in Prague, but I don't recollect any specific names. 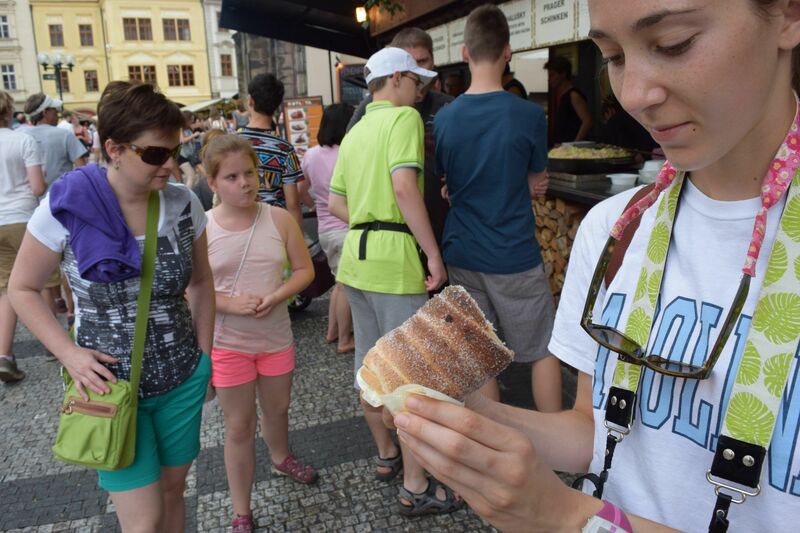 We did try (several times since they didn't have apple strudel) the Trdelnik that are sold on street corners and in marketplaces. 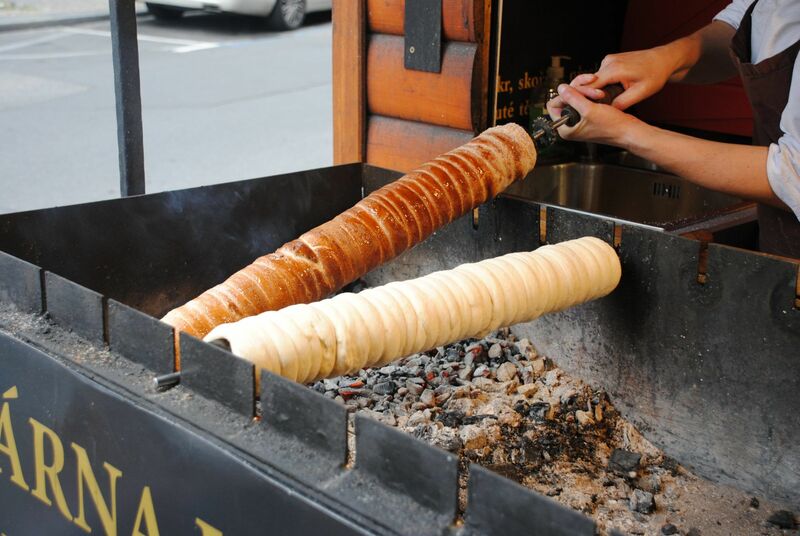 Trdelnik are rolled dough wrapped around a metal stick, grilled over coals and then rolled in sugar, spices and nuts…yeah…it's good. This was my second trip with Headwater Tours. My first was several years ago when I hiked through Alsace-Lorraine with a girlfriend of mine. I came home from that trip, shared my experiences with my family and we decided that we all wanted to do it. This was the year! We chose the Austrian Lakes Walk for a couple of reasons; we wanted an independent (no guide) walk, we wanted to travel from inn-to-inn as opposed to staying at one inn and taking day trips, we wanted to be farther north than south due to the heat of the summer and we have never been to to Austria or northern Europe. This hike did not disappoint. 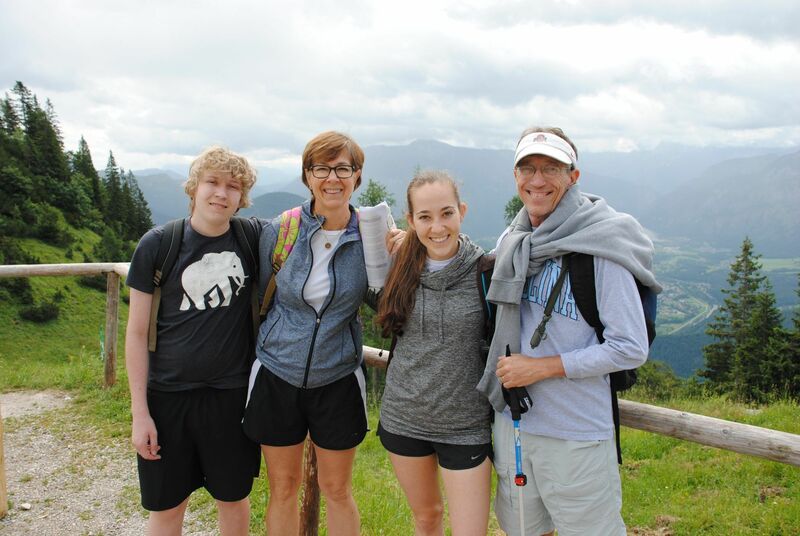 In a nutshell, the four of us hiked an average of 12 miles a day through the mountains and around the lakes in the Salzkammergut region of Austria, spending our nights in Bad Ischl, Strobl, St. Gilgen, Fuschl and Mondsee. It's my idea of hiking as our suitcases were transported from one picture perfect inn to the next picture perfect inn by Headwater Tours. Our Headwater Representatives in Austria, Colin and Jill, were delightful, informative and reliable. Headwater provided us with a map and directions from inn to inn, but after that, we were on our own. 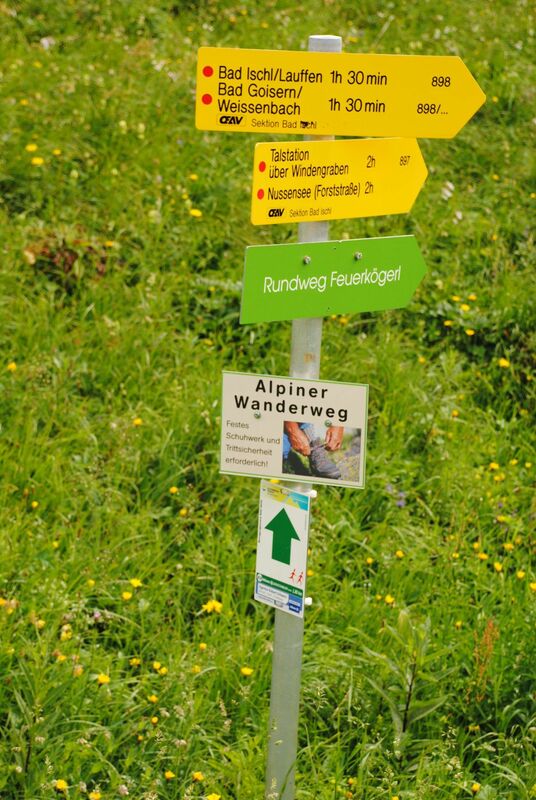 The trail system throughout Austria was clearly marked. 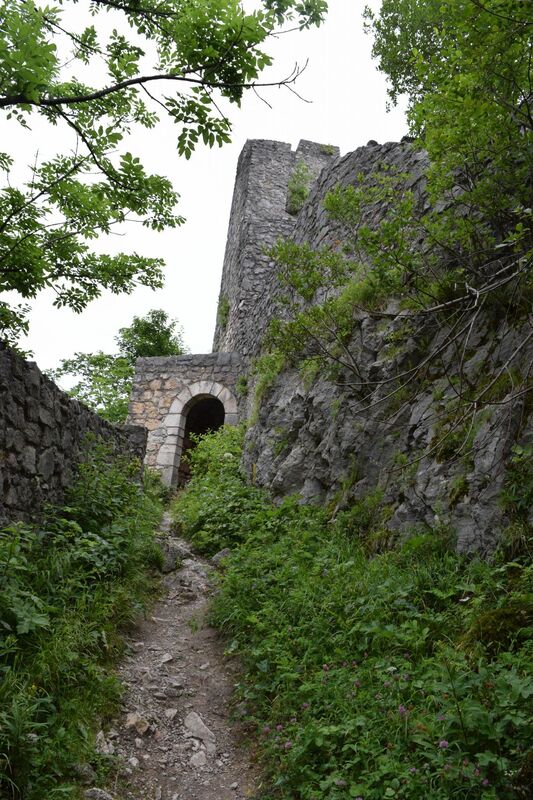 From the pictures, you can see that the hiking terrain and trails were varied, as were the sights and experiences, even within each day. 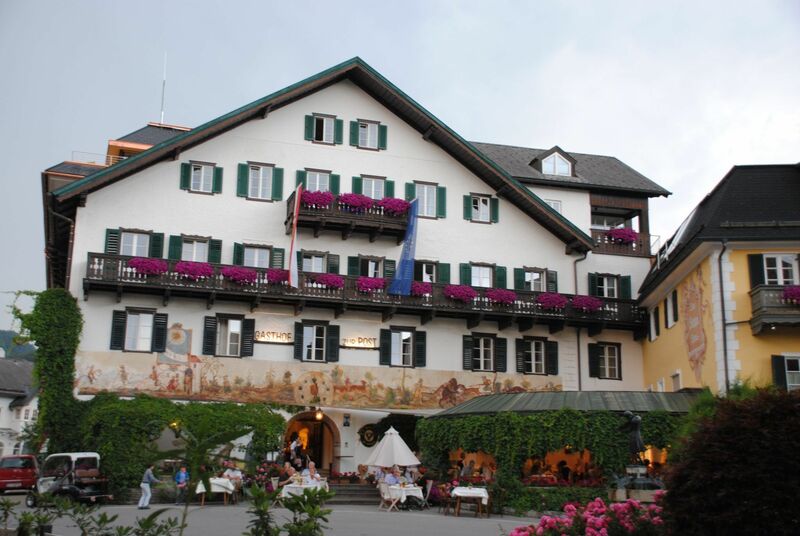 Our hotel in St. Gilgen, the Gasthaus Zur Post. Mozart's sister had her wedding reception at this hotel. 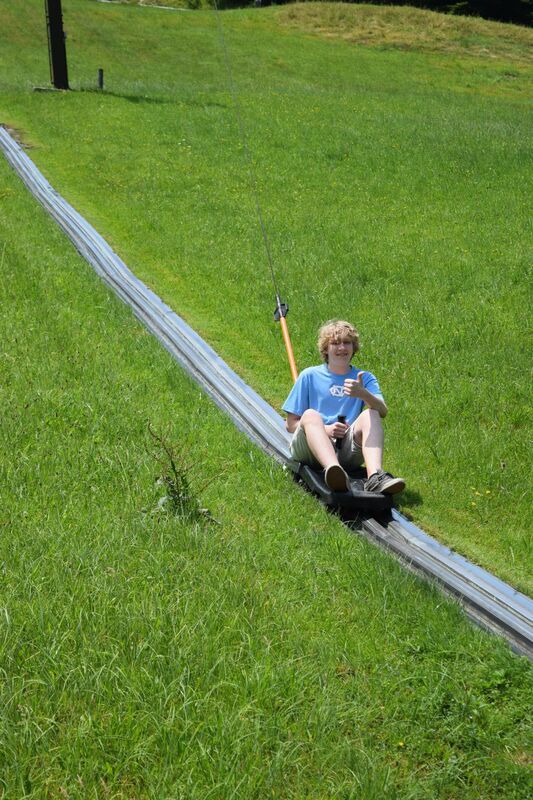 Along our hike to Fuschl, we came across this summer toboggan course. It was a wonderful journey to a part of the world we had never been before. I'd gladly share more of itinerary, just drop me a quick note. It is such a joy to read such lovely things on a very well put together travel blog. Thank you so much for the mention. It really is appreciated. Hi Marcus, so glad to hear from you! One year later and we still fondly reminisce of our Naked Tour in Prague. Thanks for stopping by and wishing you a lovely weekend. we are couple with 2 daughters age 15 and 10. planning a trip to Austria this June. I am very interested to know about the hiking tour. Hi Manisha, thanks for stopping by! I highly recommend the hiking tour with Headwater/Breakaway. They are top shelf and every inn we stayed in was perfect. Your children are a little younger than mine were, you may want to consider some of the shorter distance ones. Some days we hiked 12-13 miles. Let me knwo if I can answer any other questions you might have.